St. Martin's Griffin, 9780312607333, 320pp. Do you wish you were a savvy supermarket shopper who knows how to cut your weekly food budget, banish fast food from the dinner table and serve your family meals that are delicious and good for them? 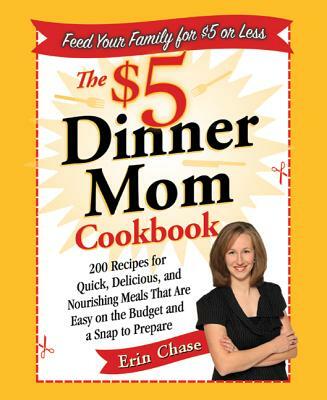 Well, Erin Chase, "The $5 Dinner Mom", is here to help. Erin is the founder of "$5 Dinners", the skyrocketing internet website that's now the go-to source for families who want to eat well and stay within a budget. Erin became a supermarket savvy mom, challenged herself to create dinners for her family of four that cost no more than $5 and is here to share her fool-proof method with you in her first cookbook that contains over 200 recipes that cost $5 or less to make. First, Erin will show you how to size up the best supermarket deals, clip coupons that will really save you money and create a weekly dinner menu plan. Then, in each recipe she shows you just how much she paid for each item and challenges you to do the same. Join the army of devoted followers who have already let Erin Chase show them how to be savvy supermarket shoppers who cook tasty, economical meals. You'll never spend more than $5 on dinner again. ERIN CHASE is the author of The $5 Dinner Mom Cookbook and The $5 Dinner Mom Breakfast and Lunch Cookbook. She's appeared on The View, The Rachael Ray Show and The Jean Chatzky Show on Oprah Sirius Radio. She lives in Dayton, Ohio, with her husband and three children.